Enjoy great entertainment at Silverstar with the Night Out for 2 package. Launching on 28 July and running until 28 September 2017, couples can enjoy a scrumptious meal, an option of movie tickets or Ten Pin Bowling, drinks vouchers and more. The package is available for only R250, with a saving of over R200 – now that’s great value entertainment! For more details on this fantastic offer, please visitwww.silverstarcasino.co.za, Ts and Cs apply. Look out for Clint & Co CCR Tribute as well as Dan Patlansky live on stage in September. Tickets are available from www.silverstarcasino.co.za or at Silverstar Box Office. Silverstar Rewards cardholders can save up to 20% on tickets prices. The Springboks will soon be taking on three of our biggest rival nations in the upcoming 2017 Castle Lager Rugby Championship. They will be clashing against Argentina in August, Australia in September and then New Zealand in October. Join Silverstar and be part of the front-row action on the big screen. Springbok supporters who are not able to attend the games at the stadium can watch the games live on the biggest outdoor screen in the West Rand, and enjoy some great entertainment and exciting giveaways. Tickets are available at R30 per person at www.silverstarcasino.co.za. Ticket prices include a free local beverage, so don’t miss out! 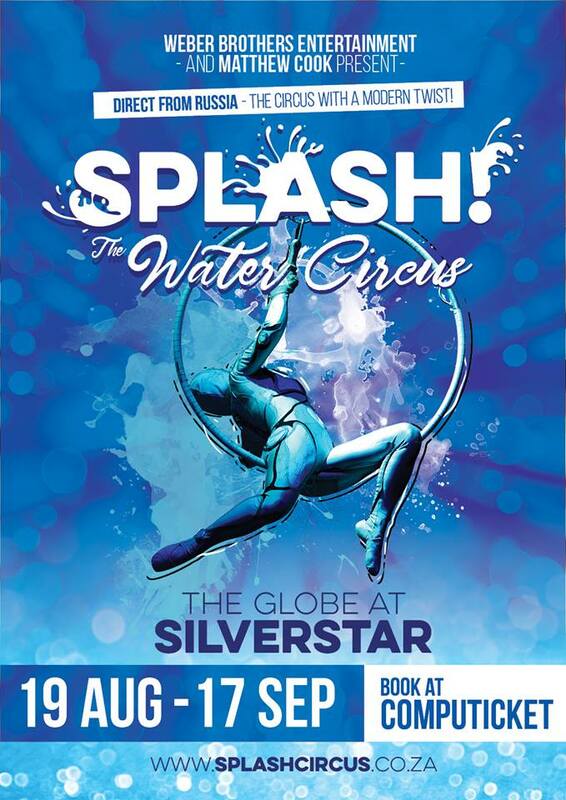 Silverstar is proud to launch the South African tour of SPLASH! - The Water Circus, presented by Weber Brothers Entertainment and Matthew Cook. Come and experience the magic of the circus presented in a custom built 12 metre diameter pool, with fantastic fountains and a laser light show. See over 40 artists direct from Russia performing a mix of the traditional circus acts you love, some unique never-before-seen-performances, as well as death defying extreme stunts, and spellbinding synchronised swimmers. 19 August to 17 September ONLY! Ticket prices range from R100 to R375 and Rewards cardholders save up to 20%. Book now on www.silverstarcasino.co.za. Get in on all the action with the latest blockbusters! Remember to take advantage of the WOW Wednesdays movie discounts, or simply sign up to Silverstar’s Rewards Programme and enjoy ongoing movie discounts of up to 30%. Cosy up with a variety of delightful food and drink offerings from a selection of restaurants and fast-food outlets at Silverstar. Whether you are looking to grab food on-the-go at Steers or Mi Vami; a family dining experience at Steak, Spur, Billy Gs; pub grub at Publicity or a romantic winter dinner date at Vigour and Verve, Colcaccios or Calistos, Silverstar offers a taste for everyone. Visit the newly-opened Aarya restaurant, owned by MasterChef SA winner, Chef Deena Naidoo. Aarya is guaranteed to offer you a unique dining experience with a menu that appeals to every palate. Ready Set Drive - Another spectacular run of the Ready Set Drive promotion has officially launched at Silverstar. Running until 21 October 2017, chic new sets of wheels and cash prizes to the total value of R2.6 million up for grabs! For thirteen weeks, thirteen Renault Clios will be given away every Saturday at 20:00! Cash prizes are also up for grabs. To participate, players must earn points for entries by playing any Slots or Tables. This promotion is exclusive to Silverstar Rewards cardholders. 18+ only | Winners know when to stop. National Problem Gambling Counselling 0800 006 008. Rules with complete offer available at silverstarcasino.co.za or at the Customer Services Desk. Check out our social media pages on Twitter at https://twitter.com/SilverstarZA or Facebook at https://www.facebook.com/SilverstarCasino/.